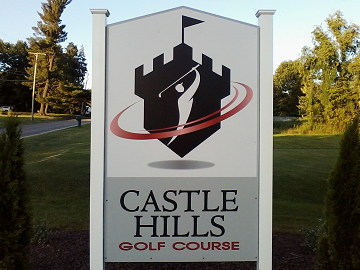 The grande dame of Western Pennsylvania golf courses, Castle Hills opened in 1930. 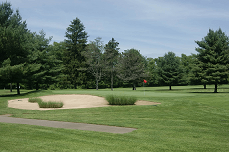 Located just two miles north of New Castle, Pa., this scenic 18-hole course features 24 manicured fairway and greenside bunkers, lush rolling fairways, lakes and streams. Golfers of all skill levels will enjoy this challenging course, which includes a driving range with a large grass tee area. Our pavilions (complete with charcoal grills and electricity) can turn a rewarding game of golf into a delightful social event. Castle Hills Golf Club offers a fully stocked beer and snack bar, and catering for special events is available on request. Check out our rates — you’ll see your green fees buy a lot of great golf at Castle Hills Golf Club. The following rates include a cart. Senior rates are for players 60 years of age or older. When we have a shotgun tournament on a Saturday or Sunday morning, after the tournament is finished, it's a great time to enjoy our weekend specials that start at 1 pm. The course will be wide open and the weekend special prices are: $29 for 18 holes with cart, and $20 for 9 holes with cart. The Northeast Ohio and Northwest Pennsylvania area is ranked by Golf Digest as the 4th best golf destination in America. 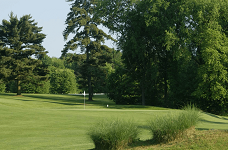 We are proud to be part of the Penn Ohio Golf Trail, which features more than 10 lodging locations and over 20 family-owned and operated eateries located on premises or minutes from lodging. We welcome your questions or comments about golf at Castle Hills. Here's how to contact us. © Castle Hills Golf Course. All rights reserved.